Oui, il peut venir ce soir. Yes, he can come tonight. Je peux avoir de l'eau? Elles peuvent mettre la table. They can lay the table. "Vous pouvez vous garer ici." In this sentence, why do we use the subject "Vous" twice? Is it incorrect to write it as "Vous pouvez garer ici" ? You use "vous" twice because "se garer" is a reflexive verb. You can park yourself here. 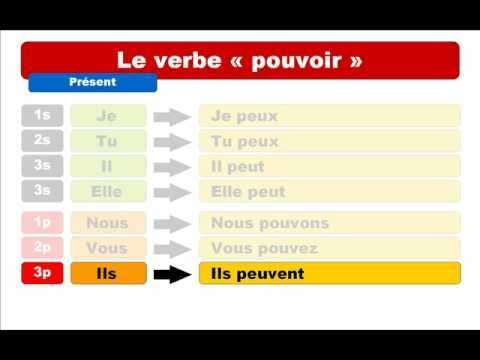 In French there exists a lot of reflexive verbs and some verbs which can be used either in a reflexive or a "standard" way. On peut dire aussi "Je puis", je crois. Mais c'est pas accepté dans les quiz. Pourquoi? Hi Jose - "Je puis" is an archaic form that is almost never used except in very formal situations (mostly written). You would use "Puis-je ... ?" as a question, but in almost all cases "Je peux ..." is the correct way to say "I can". In the context of the sentences in the kwizzes, "Je puis" isn't really correct because it would sound strange.